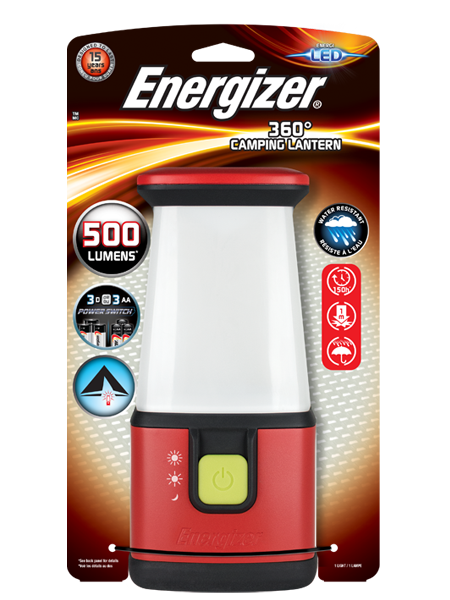 The Energizer Camping Lantern is our most powerful Emergency lantern ever, combining extraordinary 360° brightness and exceptional run-time. Engineered for extra-long use, it provides all-round illumination and enables hands-free operation. Simple to operate, the highly-visible, glow-in-the-dark switch gives quick access to 3 power modes: high mode for maximum brightness and an impressive runtime. Low mode for an exceptional runtime when you need it. And night light mode for an extended amber colour diffused light for soft illumination. Power Switch technology offers the convenience of using different battery types 3 D Energizer Max batteries for maximum performance or the popular ‘double-A’ size a perfect solution if you only have those to hand. Its durable construction offers reliable impact and water resistance (IPX4) for peace of mind in all weather conditions.